Losing weight, having a weekly routine and supporting others who are experiencing mental health difficulties are some of the reasons why Gordon King leads a Health Walk. their face, having forgotten about their worries for at least a wee while”. week, rain or shine (unless the bus route is blocked by snow). He is also a carer for his sister. He has an excellent way with people and understands that everybody is different. His friendly and relaxed manner really helps to put newcomers at ease and makes them feel part of the group quickly. Gordon got involved with the Health Walk project Get Walking Lanarkshire via the Routes to Work service which aims to improve people’s employability through skills training. On completing his Support Worker training with LAMH they encouraged him to attend Paths for All’s Health Walk Leader training in 2014. He then went on to lead Health Walks in Hamilton for LAMH and in Lanark for Clydesdale Community Initiatives (CCI). Even though the Health Walk in Lanark is now no longer running, Gordon continues to volunteer for CCI. 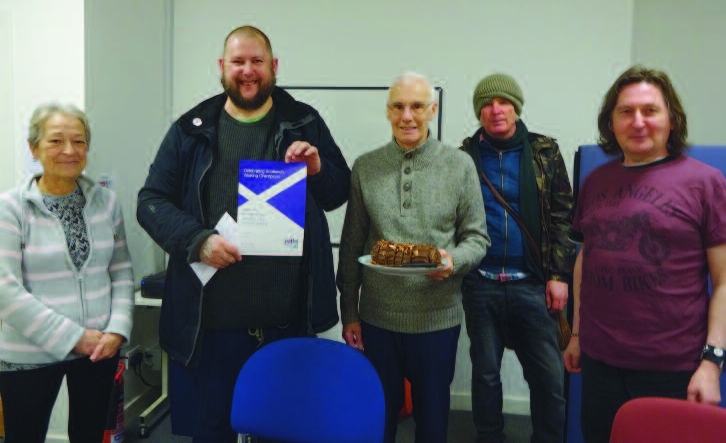 Gordon is pictured with some of his walkers receiving his Walking Champion certificate after being nominated in Path for All’s 2018 Volunteer Awards.